VRC Sprint Classic runner-up Shamexpress has headed to Danny O’Brien’s Barwon Heads property with the lucrative autumn sprints in his sights. O’Brien said taking Shamexpress, winner of last season’s Newmarket Handicap, to Perth for the Winterbottom Stakes (1200 m) on November 23 was not a consideration. "He has headed down to Barwon Heads to get ready for the (Black Caviar) Lightning and Newmarket," O’Brien said. "He went super on Saturday, it’s unfortunate the race didn’t pan out. 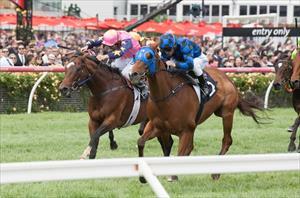 There wasn’t much pressure on Buffering and then we were held up for too long," O’Brien said. O’Brien said Cox Plate winner Shamus Award is also down at Barwon Heads with the Australian Guineas his first autumn target. "He’ll have a similar preparation to what All Too Hard had last season." Belle Couture, the little half-sister to Black Caviar, arrived at O’Brien’s Flemington stables on Saturday in preparation for her race debut next month. "She looks great and she will be trialling in the next couple of weeks," O’Brien said. "She just looks magnificent. She’s an outstanding, as we get closer to running her you get more excited. "Hopefully, we will see her at the races in December."